The tides, the weather, and the manner in which these effect the sea are crucial to understanding the behaviour and feeding patterns of sea fishes. 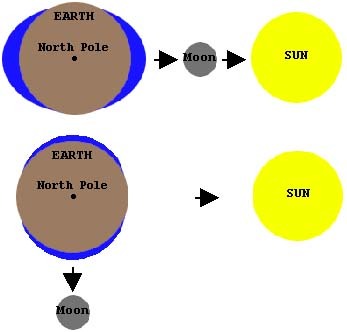 The tides are due to a double bulge of water, on either side of the earth, caused by the attraction of the moon. If the moon was stationary in relation to the rotation of the earth, each coastal point on the earth’s surface would experience high and low tides exactly twice in a twenty-four hour day. Because the moon is not fixed, the tides are later by about forty minutes each day. The obstruction of continents and landmasses greatly alters the height and patterns of the tides. Every two weeks, when the sun’s attraction reinforces that of the moon, high water is exceptionally high and low water is exceptionally low; these are the spring tides. Alternating with the spring tides are the neap tides, which have a much smaller range. The biggest spring tides occur a couple of days after the full or new moon, and on a particular stretch of coast they fall at approximately the same time of day. The sequences of high and low waters or spring and neap tides are factors of vital importance to the lives of fishes. From the anglers point of view the indirect effects of the tidal rhythms are the most important because many of the creatures on which the fish feed depend on the tides for timing their day-to-day lives. Between the tides marks, the breeding, feeding and migration activities of many worms, crabs, shrimps and prawns are often only possible when the tide is in. Even more striking is the way in which mass movements, which render the animals vulnerable to the fishes that eat them, take place on only tides of a certain height, or even only on a few well-defined tides each year. It is at these times that bait organisms are most easily collected and most effective as bait. The results of these tidal forces are profound and differ from one area to another with the complicated nature of the tidal standing wave and the earth’s rotation. In some places the range of the tides is very small with an average rise and fall of only about a metre. In other locations the tidal range can exceed 6 metres. If there is a small tidal range then the creatures fish feed on do not have to move far to escape the rising tide and danger. Obviously when the tide range is bigger these creatures have to be more cognisant of the tides and move earlier. In areas where the tidal range is small bait collecting or digging may at times be practically impossible. Another very important effect of the rise and fall of the tide is the creation of strong water currents, almost like rivers flowing within the sea. In coastal regions the main flow will generally be parallel to the trend of the shoreline. The direction of flow will usually reverse on the turn of the tide. As in a river, there will be swirls and eddies in bays and around promontories. Since the tide is rising (or falling) most quickly midway between high and low water, it is at these times that the tidal current will be strongest. The most obvious difficulty with tidal currents, as far as bait fishing is concerned, is trying to ‘hold bottom’ with either your tackle or the anchor of the boat. The usual means of combating strong currents are to use braid, employ sophisticated grapnel sinkers or to fish on the drift. 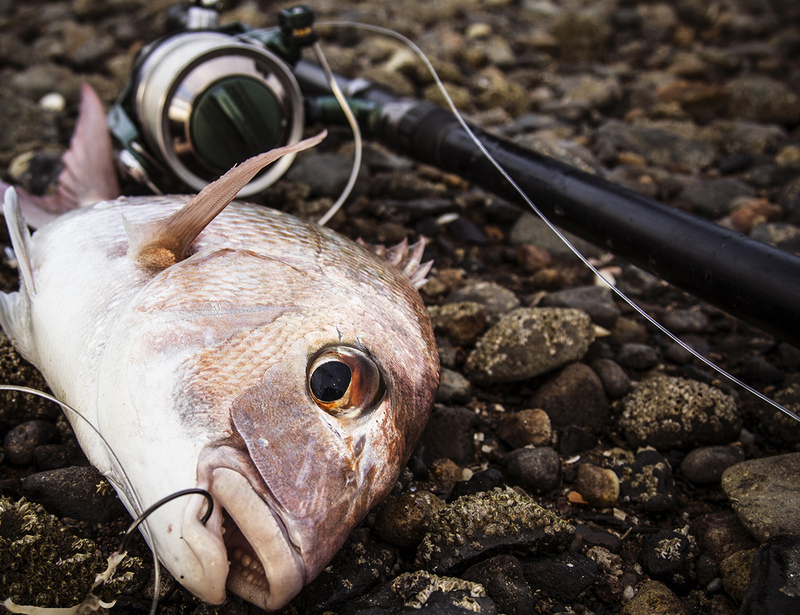 When using self-diving spinning lures it is often more satisfactory to use a lure which is designed to fish deeper and handle strong current flows than to add lead to some other form of lure. From the angler’s point of view, one of the most interesting effects of tidal currents is the creation of banks. These huge mounds of grit and shell are favoured by many of the most popular fish species, notably turbot and bass. The presence and the position of banks has been shown to be predictable from the directions of the prevailing currents and the geography of the nearby coastline. Headlands, sticking out into the sea, cause different patterns of flow on the flood and the ebb tides. In the huge `eddies’ which result, great masses of coarse sand are dumped on the seabed. All the finer material is winnowed away by the strong currents and the remaining fragments of shell and gravel are sculptured into giant ripple marks. These are enormous replicas of the ripple marks that we see on the beach and perhaps they can best be visualised as underwater sand dunes. It is in the lee of these dunes that predatory fish await their prey. What is less well known is the fact that small banks occur more or less as mirror images of the main ones on the opposite sides of the promontories. There must also be many other peninsulas projecting out into the tidal flow where similar, if lesser, banks have formed and good fishing potential is untapped. Elongated islands which lie across the main flow will, of course, create four `eddies’ and banks – two at either end. The wind blowing over the sea’s surface also creates currents of water but these are of much less importance than the tidal currents. 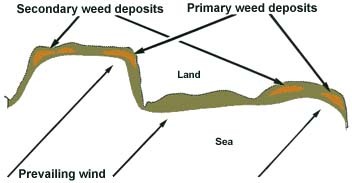 In general, an onshore wind piles up the surface water close to the beach and the result is an undercurrent flowing away from the shore. Offshore winds have the reverse effect and this can be important in pushing surface-drifting food beyond easy casting range. A much more important effect of the wind from the angler’s point of view is the creation of waves. 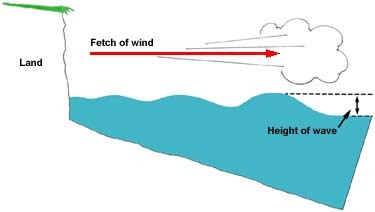 The height of waves depends on the distance for which a wind has blown over the sea surface (known as the fetch of the wind). Roughly, a strong wind blowing across four miles of sea surface will build up waves of about three feet high. 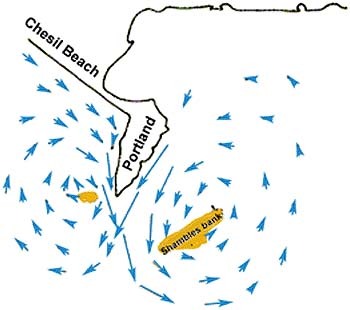 The active depth of waves (the depth at which they can effectively stir up the sea bed) is roughly half the distance between successive waves. Waves breaking along the shoreline are called plunging waves and are caused by the waves ‘feeling the bottom’ in shallowing water. The other thing that happens to waves as they approach the shoreline is that they tend to slow down and the distance between them becomes less. However, the height of the waves is not much affected so they become steeper and the tops slide or spill off. It follows from all this that only along the waterline, or in fairly shallow water, will waves stir up the sea bed to any appreciable extent, even in fierce storms. It is this stirring up which is responsible for uprooting vast amounts of seaweed and for dislodging clinging, hiding or burrowing animals from the sea bed. Under these circumstances fish will often feed avidly on dead or damaged creatures and it is during the period of declining seas, after storms, that good catches will often be made by bottom fishing with bait in inshore waters. An oily swell, turbid dirty water and heaps of freshly deposited weed along the tideline are indications of good conditions. Fish normally caught at night may be found feeding actively in the daytime during such periods. It is very important to take into account the state of the tide and wave conditions when venturing out onto the flats. Sometimes strong onshore winds and powerful wave action at the harbour mouth can dramatically slow down the rate at which water leaves the harbour. This means that under these conditions the tide may never reach the low level predicted in the tide tables. Be warned. When fishing estuaries, it is generally best to fish the last few hours of the outgoing tide to avoid getting cut-off by the incoming tide and always take into account what is happening at the harbour mouth before venturing out. The only exception to this rule is when high tide coincides with dawn over summer and I know from experience that there will be kingfish hunting crabs and flounder in the flooded shallows. The easiest way to work out when to venture onto the flats is to look at the tide graphs on the http://www.tides4fishing.com/ website. An example of this is shown below. In the spot I regularly fish on the Manukau harbour it is possible to get out onto the flats to fish the channel holes easily when the tide height has dropped from the high tide level to 2.0 metres. On the day shown in the graph above that happens around 7.15 am. (If you take a line out to the right from the 2.0 metre point on the Y axis of the graph and see where it intersects with the tide curve and drop a perpendicular to the X axis the intersection point is around 7.15 am). The tide was exactly where I’d expected it to be when I ventured out at dawn and for once the predicted period of very high fish activity was spot on. There is nothing more satisfying than when a plan comes together. As an interesting aside, in the table above the period of fish activity is predicted from Solunar tables. In the areas I fish the Solunar peak activity times almost always coincide with the last two hours of the ebb tide. It helps immeasurably in deciding when is the best time to go fishing.